Hawaii this week will resume monthly statewide testing of its Cold War-era nuclear attack warning sirens for the first time in about 30 years, in preparation for a potential missile launch from North Korea, emergency management officials said on Monday. Wailing air-raid sirens will be sounded for about 60 seconds from more than 400 locations across the central Pacific islands starting at 11:45 a.m. on Friday, in a test that will be repeated on the first business day of each month thereafter, state officials said. Monthly tests of the nuclear attack siren are being reintroduced in Hawaii in conjunction with public service announcements urging residents of the islands to “get inside, stay inside and stay tuned” if they should hear the warning. “Emergency preparedness is knowing what to expect and what to do for all hazards,” Hawaii Emergency Management Agency chief Vern Miyagi said in one video message posted online. He did not mention North Korea specifically. But the nuclear attack sirens, discontinued since the 1980s when the Cold War drew to a close, are being reactivated in light of recent test launches of intercontinental ballistic missiles from North Korea deemed capable of reaching the state, agency spokeswoman Arlina Agbayani told Reuters. A single 150-kiloton weapon detonated over Pearl Harbor on the main island of Oahu would be expected to kill 18,000 people outright and leave 50,000 to 120,000 others injured across a blast zone several miles wide, agency spokesman Richard Rapoza said, citing projections based on assessments of North Korea’s nuclear weapons technology. 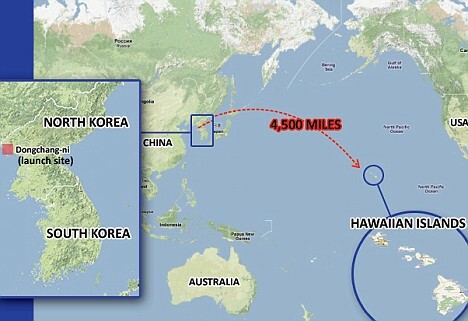 Oahu, home to a heavy concentration of the U.S. military command structure, as well as the state capital, Honolulu, and about two-thirds of the state’s population, is seen as an especially likely target for potential North Korean nuclear aggression against the United States. In the event of an actual nuclear missile launch at Hawaii from North Korea, the U.S. Pacific Command would alert state emergency officials to sound the attack sirens, giving island residents just 12 to 15 minutes of warning before impact, according to the state’s fact sheet. In that case, residents are advised to take cover “in a building or other substantial structure.” Although no designated nuclear shelters exist, staying indoors offers the best chance of limiting exposure to radioactive fallout. The siren tests are being added to existing monthly tests of Hawaii’s steady-tone siren warnings for hurricanes, tsunamis and other natural disasters. Those alerts also undergo monthly tests on radio, TV and cellphone networks. Erdogan says Turkey seeking to annul Trump decision on Jerusalem at U.N.